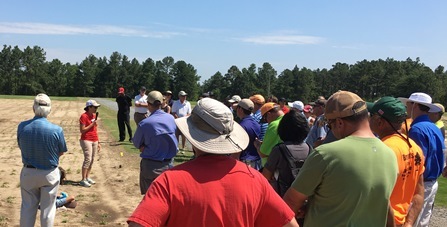 The 2017 Sandhills Research Station Turfgrass Regional Conference offered more than ever before this year with the addition of a special classroom component. After a welcome from SRS Operations Manager Jeremy Martin and opening remarks by Richard Clark of the NCDA and Dr. Reid Evans, Assistant Director of the N.C. Agricultural Service at NC State, the Education Section was under way, covering several areas of turf content. After a refreshment break, attendees moved outside to the Field Stops, for presentations from faculty of the award-winning NC State Turfgrass program. Then all returned to the fan-cooled building to claim their Panera box lunches and sit down for a jovial, well-deserved meal. A big thank you to all our industry supporters. It was a great event, and we’re already making plans for next year!